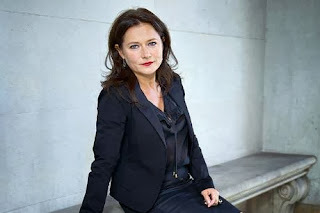 Looking Our Best has made no secret of her crush on grown-up, fictional Danish heroines, from woolly- jumpered- super sleuth Sarah Lund, to Prime Minister Birgitte Nyborg. Watching the start of Season 3 of Borgen on BBC Four last weekend, LOB is even more in awe of Birgitte's air of confidence. 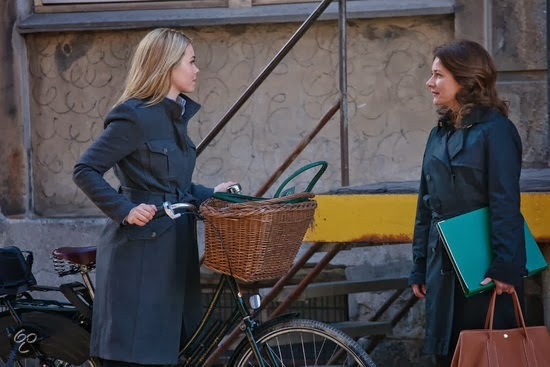 When it comes to serious women garb, she, along with the series’ other key female characters, Katrine Fonsmark and Hanne Holm, tend towards the neutral end of the palette, in their grey, navy and black - all in keeping with that dark Nordic light. But their appeal as serious women is not just the tailored clothes, it's the poise and posture of Sidse Babett Knudsen (who plays politican Nyborg), and Birgitte Hjort Sorensen, (who plays journalist Katrine) that mark them out as no-nonsense, no dumbing-down women to be reckoned with in a supposedly man's world. Alas, standing straight and walking tall has never been this blogger’s strong point – the only bit of Danish being in evidence is the over-indulgence in said pastries showing on the expanding LOB middle. Bad posture is a characteristic of many of us grown-ups as the years advance, and with it comes the fear of the dreaded dowager's hump. That’s why one of the great style lessons isn’t necessarily about spending a fortune, but checking posture by sitting straight and walking tall. And looking like you mean business, whether an aspiring politician, hot shot journalist, or just looking to get a seat on the bus. Speaking of classy tailoring, it’s definitely worth checking out Dunnes Stores and a new clothing collection designed exclusively by Carolyn Donnelly. Carolyn’s successful retro Homewares range for the store is now joined by The Edit, and as the name suggests, this is a collection of pared-back, key pieces which speak effortless elegance. For LOB, there is a slight hint of Scandinavian label COS in The Edit's simple shift dresses (with practical side seam pockets) or a tailored double breasted, belted coat. Colours are suitably low key, in either black or navy, but with shot or red or plum in there too. Styles, in fact, that would appeal to those awesome Danish telly heroines above. Which is kind of where we came in ….